Fabulous location on Ideal Beach area of Lake Wawasee w/50 ft. of lake front sandy beach to enjoy countless days in lake & sun. Ideal Beach has the best lake bottom around! Adjacent lakefront property is also available. Stunning location for gorgeous panoramic lake views in this 4 bedroom, 3 full bath home with plenty of room for friends & family. This open floor plan was designed to capture lake views. Soaring center beamed cathedral ceiling in main gathering room facing lake w/high double stacked windows & large brick fireplace with hand hewn wood mantle. Dining area has bay window. Meal prep with a lake view is easy in this large kitchen w/ample oak cabinetry, glass front cabinets & breakfast bar. Kitchen appliances remain. A family room, 2 bedrooms & full bath complete this level. Beautiful open staircase leads up to the owner's private level. The bedroom has a lofted feel w/lake views. The bathroom offers his & her vanities, a makeup area, walk-in shower & jetted tub. The basement has the 4th bedroom, a full bath, a seating or flex room, a laundry area & storage. There are 2 stairway entrances to the basement. Detached 2 car garage w/handy service door plus ample parking pad for family & guests. 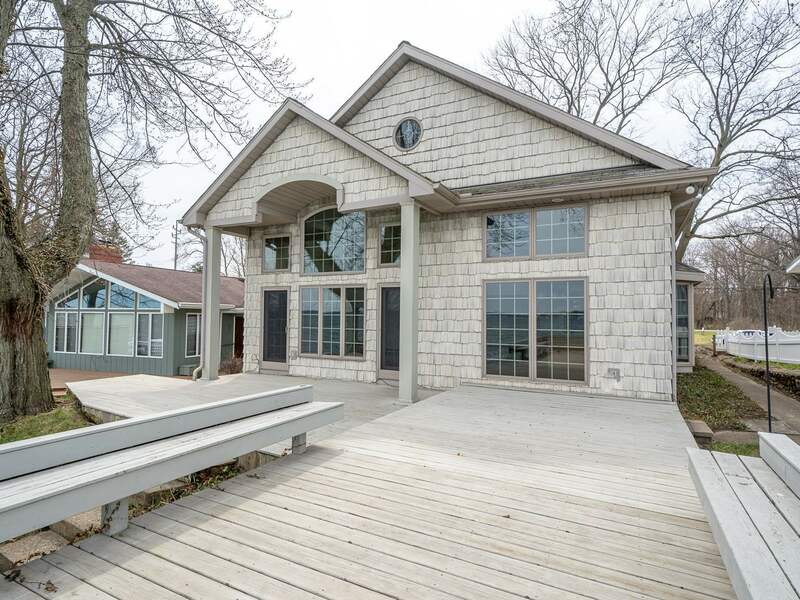 Lakeside sprawling deck w/built in seating offers unobstructed lake views. Tunnel to lake/sea wall via basement; a convenient way to store lake toys, pier, etc. An amazing location, a large open floor plan for main living area, lots of natural sunlight, hardwood flooring; all the elements you need to make this fixer upper your own. Lake Wawasee is the largest natural lake in Indiana; 25 miles of shoreline, 3000+ acres in size, with a maximum depth of 77 ft. This gorgeous lake is filled with relaxation, fun & recreation as an all sports lake for boaters & skiers, complete with a sandbar, 28 species of fish, boat accessible restaurants, marinas & yacht clubs. Paddle board, kayak, wake board, or an easy pontoon cruise. Fabulous sandy beach area around pier for swimming & having fun. Lake depth to end of pier is still 4-5 ft. Great view to watch weekend sailing competitions, Sunday morning wooden boat parade, fireworks & July 4th flotilla. Enjoy weekend getaways, retirement or year-round lake living. Centrally located only 2.5 hours from either downtown Chicago or downtown Indianapolis, or an easy 1 hour from South Bend or Fort Wayne. Located off of SR13 w/quick access to town. Pier 549.